444 pages | 44 B/W Illus. This comprehensive guide serves to illuminate the rise and development of FinTech in Sweden, with the Internet as the key underlying driver. The multiple case studies examine topics such as: the adoption of online banking in Sweden; the identification and classification of different FinTech categories; process innovation developments within the traditional banking industry; and the Venture Capital (VC) landscape in Sweden, as shown through interviews with VC representatives, mainly from Sweden but also from the US and Germany, as well as offering insight into the companies that are currently operating in the FinTech arena in Sweden. The authors address questions such as: How will the regulatory landscape shape the future of FinTech companies? What are the factors that will likely drive the adoption of FinTech services in the future? What is the future role of banks in the context of FinTech and digitalization? What are the policies and government initiatives that aim to support the FinTech ecosystem in Sweden? Complex concepts and ideas are rendered in an easily digestible yet thought-provoking way. The book was initiated by the IIS (the Internet Foundation in Sweden), an independent organization promoting the positive development of the Internet in the country. It is also responsible for the Internet’s Swedish top-level domain .se, including the registration of domain names, and the administration and technical maintenance of the national domain name registry. 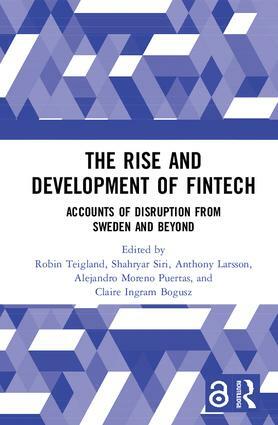 The book illustrates how Sweden acts (or does not act) as a competitive player in the global FinTech arena, and is a vital addition to students and practitioners in the field. Robin Teigland is Professor of Business Administration with a specialization in Strategic Information Systems Management and Co-director of the Center for Strategy and Competitiveness at the Stockholm School of Economics (SSE), Sweden. Shahryar Siri is a Researcher and Project Manager at the Stockholm School of Economics Institute for Research (SIR), Sweden, where he is responsible for the three-year research project "The Innovative Internet" in collaboration with the Internet Foundation in Sweden (IIS). Prior to his role at SIR, he worked as a Consumer Insights Researcher at Ericsson and on a freelance basis. Anthony Larsson is a Doctoral Candidate of Medical Science at Karolinska Institutet (KI), Sweden, and a Researcher at the Stockholm School of Economics Institute of Research (SIR), Sweden. He holds a MSc in Business & Economics, an MBA in Business, a MSc in Political Science, a MSc in Anthropology and an A.S. in Psychology. His research interests include management, organization studies, entrepreneurship, innovation studies, customer loyalty, digitalization, branding, stakeholder analysis, political science, anthropology, and qualitative research methods. Alejandro Moreno Puertas is a MSc finance student at the Stockholm School of Economics (SSE), Sweden. He has previously worked in Shanghai as a representative of Sociedad Española de Negocios en Asia y America SL for their Chinese business development. He graduated from Tilburg University with a BSc in economics. Claire Ingram Bogusz is a Researcher at the Stockholm School of Economics (SSE), Sweden. Her research interests are in how code-based technologies affect entrepreneurship and organizational change. Her PhD thesis examined FinTech entrepreneurship reliant on peer-to-peer technologies.